Hi all! Like so many folks, I was anxiously awaiting Marlon James' African Game of Thrones. While I hesitate to review it, I did want to write about it and have a long essay for your thoughts and enjoyment. Thanks for sticking around! After the success of A Brief History of Seven Killings (2014), acclaimed writer Marlon James declared his next novel would be an “African Game of Thrones” (VanderMeer). In 2019, Black Leopard, Red Wolf hit the shelves, though speculative fiction reviewers immediately distanced the book from Game of Thrones. Instead, Victor LaValle suggested James was taking on J. R. R. Tolkien’s cementation of the mythic European quest tale but that James “is here to kill that noise” (LaValle). The novel feels more in conversation with Tolkien than George R. R. Martin, particularly in the focus of a quest, but also in the frame. Technically, The Lord of the Rings is written as a continuation of Bilbo’s There and Back Again, which is published as The Hobbit. James also incorporates a frame (or frame upon frames) in telling Tracker’s quest. Jeff VanderMeer’s review reminds readers that James represents a generation of writers killing the noise around Tolkien and white-centered fantasy: “It’s just plain lazy to compare this novel with, say, works from the last decade by Nnedi Okorafor or David Anthony Durham or [N. K.] Jemisin or Minister Faust or Nisi Shawl or Kai Ashante Wilson” (VanderMeer). A cohort of authors have helped make Marlon James’ book possible, but his book remains so unlike these novels that grouping them together feels inept, as VanderMeer writes. Indeed, this novel would not be grouped with Okorafor or Durham on the bookshelf, even though it very much requires a knowledge of speculative fiction to successfully read. While these authors engage with postcolonial themes, I argue that James’ Black Leopard, Red Wolf subverts the postcolonial tradition through epic fantasy but by relying on oral storytelling, the novel joins texts like Rushdie’s Midnight’s Children and Julia Alvarez’s In the Time of the Butterflies. By using Italo Calvino’s narratology theory (the study of the function and structure of narrative) of the levels of reality, this epic fantasy can be read as post-post-colonial, as James once labeled himself, while still being illuminated by postcolonial theory (Mayer). The repeated orality in signature postcolonial texts suggests a reclamation of the oral that expands beyond the novel. First, the novel form is not ideal for oral stories. While many writers have used an oral framework to great acclaim—Rushdie’s Midnight’s Children or Faulkner’s Absalom, Absalom! for example—the novel undermines these frameworks by its very form of print or when the orality calls attention to the form of the novel, thus dispelling the illusion. The amount of oral frameworks in postcolonial novels suggests a revolutionary tendency, that telling stories holds power over the oppressor. As Helen Young writes: “Colonisation and imperialism silence the voices of the colonised, rendering them spoken for and about, to such an extent that one of the foundational questions of postcolonial theory was ‘can the subaltern speak?’” (116). Oral frameworks reclaim the silenced voice, but the orality also creates a truth for the reader as a witness, thus accessing the genre of the testimonio. The testimonio connects to the reader through an empathetic narrator telling the atrocity. While linked to Latina/o/x literature, John Beverly’s description of the testimonio encompasses literature beyond place: “By testimonio I mean a novel or novella-length narrative in book or pamphlet (that is, printed as opposed to acoustic) form, told in the first person by a narrator who is also the real protagonist or witness of the events he or she recounts, and whose unit of narration is usually a ‘life’ or a significant life experience” (31). This description adequately contains a novel like Alvarez’s In the Time of the Butterflies, which fictionalizes the lives of the Mirabal sisters under the Dominican dictator Trujillo, but what happens when magical realism injects the text, such as Rushdie’s Midnight’s Children? Technically, Marlon James’ Black Leopard, Red Wolf functions as a testimonio, but it is not a testimony of history. As more postcolonial writers use speculative elements to engage with their stories, the use of oral frames to create a fantasy suggests a unique intersection of speculative, postcolonial, and narratology studies. Black Leopard, Red Wolf represents this intersection by reaching past the colonial to classical oral epics. While focused on African literature, Ogundele captures the opposite ends of the spectrum between speculative postcolonial and literary postcolonial—respectively, a focus on imagining alternate pasts or new futures versus recording or fictionalizing history. For example, David Anthony Durham’s Acacia Trilogy creates a fantastical world where the colonizers become the colonized, allowing space for a detailed exploration of power structures and systems of oppression. Black Leopard, Red Wolf sidesteps even this exploration of colonization as James creates a fantasy world filled with the universal rather than the historically specific. In regarding the novel as a world of its own versus the novel as a product in a physical reality, Calvino writes: “We have to consider the work as a product, in its relation to the outside world in the age when it was created and the age when we received it. In all periods and in all literatures, we find works that at a certain time turn around on themselves, look at themselves in the act of coming into being, and become aware of the materials they are made of” (103). Calvino presents a formula for “connecting links between levels of reality in the works of literature” (109). Ultimately, Calvino defines the goal of this exercise so as to understand that “literature does not recognize Reality as such, but only levels” (120). These levels carry a set of rules or believability, such as Tracker’s reality where a man can become a leopard, which is separate from the Inquisitor’s reality, who compares the tales to “reciting nightmares” (98). Calvino’s formula reads: “I write that Homer tells that Ulysses says: I have listened to the song of the Sirens” (108-9). The Sirens’ song, or the inside of the frame, represents another level of reality separate from the other layers represented by “I,” “Homer,” and “Ulysses.” Black Leopard, Red Wolf can be formulized similarly: Marlon James writes that the Inquisitor records that Tracker says: “The slaver nodded to his date feeder and the date feeder cleared his throat and began. ‘This woman, her story, very strange and sad’” (139). While this formula might aid with comprehension of the novel, Calvino argues for a collective power in such a narrative: “With all of them, in the ‘I’ of the writing first person one can distinguish one or more levels of mythical or epic reality that draw material from the collective imagination” (107). These oral stories within oral stories within the novel become reflective of not only Tracker and the Inquisitor, but of a mythic collective underrepresented in epic fantasy, thus returning to the earlier point by Calvino that at times works “become aware of the materials they are made of” (107). Eventually these frames might spiral into silence, just as Tracker speaks the last line: “Tell me” (620). All realities are silenced, waiting. In conversation with the testimonio, James’ novel could be read as allegorical for the historical atrocities of imperialism on the African continent (much as Tolkien’s work can be read as allegorically anti-fascist), but through Calvino’s formula, with each level of reality containing its own believability, the novel becomes pure epic fantasy, as described by Tolkien: “The gems all turn into flowers or flames, and you will be warned that all you had (or knew) was dangerous and potent, not really effectively chained, free and wild; no more yours than they were you” (147). This freedom aligns with the anti-imperialist aims of postcolonial literature, but if postcolonial literature often emphasizes the political and the historical, as Ogundele says of African literature, then is there space for epic fantasy in the postcolonial mode? Akshya Saxena defines postcolonial studies in 2018 as “one of surfacing histories and forms of empire in the globalization of capital” (317). This definition troubles the idea of a postcolonial epic fantasy as it either forces the epic fantasy to be read as an allegory or risks dehumanizing the survivors of atrocity through the lens of sword & sorcery. A third option appears if one views a postcolonial epic fantasy as undermining the empire of traditional fantasy. A lie is a tale carefully told if allowed to be told, and I would seek to break [Tracker’s] untruth by asking him to tell a different part of the tale. So I asked him not of the first search or the second, but of the four years in between. INQUEST: Tell me of the year of our King’s death. The format separates the levels of narrative, but also the sense of authority. While Tracker asserts his voice in the narrative, the Inquisitor controls the presentation and how the story is received, particularly by those in power. Indeed, this frame represents the most direct relationship to postcolonial literature by focusing on who controls the story and what stories are told or suppressed. While plenty of speculative fiction explores ideas of colonialism, James’ novel remains a traditional epic fantasy in its lack of engagement with “forms of empire,” as Saxena writes. Speculative postcolonial often focuses on, as Grace L. Dillion describes, “the destabilizing effects of internal colonization on cultures that for good or ill welcome advanced technologies and first-world hypercommodification while overlooking tricontinental economic interests” (220). Again, this is not the story Tracker tells. The story Tracker tells remains fantasy in more ways than one. Whether it’s the outward product—James’ African Game of Thrones—or the Inquisitor’s belief that Tracker tells tall tales, the monsters that populate the lands, both human and other, feel unique to James’ world rather than stand-ins for a historical event or strictly African culture. As Priya Joshi asks: “For how many years after empire ends does writing have to be ‘post’ before it can become itself” (233)? In an interview with The Guardian’s Alex Preston, James expresses a similar sentiment: “As people of colour in the diaspora, we’re particularly interested in stories that go beyond slavery. I’m tired of that being seen as the furthest in the past we can go or that swords and sorcery aren’t available to us” (Preston). To that end, the stories Tracker does revel in are often brutally violent, sexual, traumatic, and riddling. Immediately, Tracker establishes his prowess as a fighter by describing how, after an exhausting trek, he’s jailed with five men—only one left the cell alive. He tells the Inquisitor: “The other four. Make record as I have said it” (5). The following description is the longest paragraph in the first chapter as he describes the kills with vivid, sensory details such as “I heard his heart pop” and “[I] bashed his head until his face smelled fleshy” (5). James links this early description of violence with the overarching oral frame narrative when Tracker explains why he left one of the men alive: “I let the half-blind man live because we need stories in order to live” (5). Indeed, Tracker lives by stories as his work often comes because somebody heard about the prowess of his nose. Stories about Tracker eventually lead him to join the quest for the lost child, the story he tells the Inquisitor. Like the griots invoked throughout the novel, Tracker becomes a story-carrier. Unlike the narrators of other postcolonial texts with oral frameworks, Tracker’s stories do not unite a nation or uncover a forgotten history but turn the relationship between a shape-shifting man and a tracker into a violent epic. While not all postcolonial literature engages with nation-building or fictionalized history, Tracker’s story seems uniquely post- such concerns. The impact of postcolonial literature can best be seen through the power imbalance between Tracker and the Inquisitor, particularly due to who controls the story. James has described Black Leopard, Red Wolf as the first part in the Dark Star trilogy, with each novel retelling the same quest for the boy but from different viewpoints (Preston). Thus, more layers of oral complexity, and levels of reality, can be expected. For now, Black Leopard, Red Wolf remains an epic fantasy first and foremost but can be illuminated by postcolonial theory. Beverley, John. Testimonio: On the Politics of Truth. U of Minnesota P, 2004. Calvino, Italo. “Levels of Reality.” The Uses of Literature, trans. Patrick Creagh, Harcourt Brace Jovanovich Publishers, 1982, pp. 101-121. Dillon, Grace L. “‘Miindiwag’ and Indigenous Diaspora: Eden Robinson’s and Celu Amberstone’s Forays into ‘Postcolonial’ Science Fiction and Fantasy.” Extrapolation, vol. 48, no. 2, 2007, pp. 219–243. EBSCOhost, doi:10.3828/extr.2007.48.2.3. James, Marlon. Black Leopard, Red Wolf. Riverhead Books, 2019. Joshi, Priya. In another Country: Colonialism, Culture, and the English Novel in India. Columbia UP, New York, 2002, doi:10.7312/josh12584. LaValle, Victor. “Gods and Monsters.” Bookforum, 2019, https://www.bookforum.com/inprint/025_05/20622. Accessed March 9, 2019. Mayer, Petra. “Marlon James Wins Man Booker Prize.” NPR, 2015, https://www.npr.org/sections/thetwo-way/2015/10/13/448397179/marlon-james-wins-man-booker-prize. Accessed on March 9, 2019. Ogundele, Wole. “Devices of Evasion: The Mythic versus the Historical Imagination in the Postcolonial African Novel.” Research in African Literatures, vol. 33, no. 3, Fall 2002, p. 125-139. EBSCOhost, doi:10.2979/RAL.2002.33.3.125. Preston, Alex. 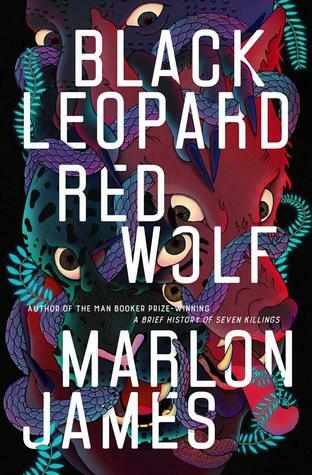 “Marlon James: ‘You have to risk going too far.’” The Guardian, 2019, https://www.theguardian.com/books/2019/feb/17/marlon-james-interview-black-leopard-red-wolf. Accessed March 9, 2019. Saxena, Akshya. “A Worldly Anglophony: Empire and Englishes.” Interventions: The International Journal of Postcolonial Studies, vol. 20, no. 3, May 2018, pp. 317–324. EBSCOhost, doi:10.1080/1369801X.2018.1443830. Tolkien, J. R. R. “On Fairy-stories.” The Monsters and the Critics: And Other Essays, ed. Christopher Tolkien, HarperCollins, 2006, pp. 109-161. VanderMeer, Jeff. “Marlon James’ ‘Black Leopard, Red Wolf’ unleashes an immersive African myth-inspired fantasy world.” LA Times, 2019, https://www.latimes.com/books/la-ca-jc-black-leopard-red-wolf-marlon-james-review-20190103-story.html. Accessed March 9, 2019. Young, Helen. Race and Popular Fantasy Literature: Habits of Whiteness, Routledge, 2015. ProQuest Ebook Central, https://ebookcentral.proquest.com/lib/knowledgecenter/detail.action?docID=3570197. Phoebe Wagner can be found studying in Nevada. Follow her on Twitter @pheebs_w.